Its not everyday that you get to sit down to an intimate dinner with one of the founding members of an internationally celebrated series of restaurants. 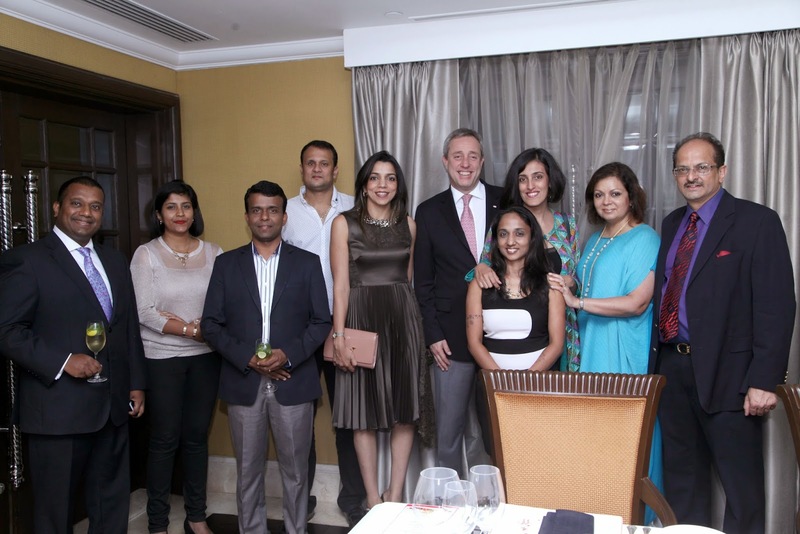 Mario Maccioni, the Vice-President of the Maccioni Group - of the Le Cirque, Circo and Sirio Ristorante chains was in the city for two days, at the Leela Palace Bangalore. 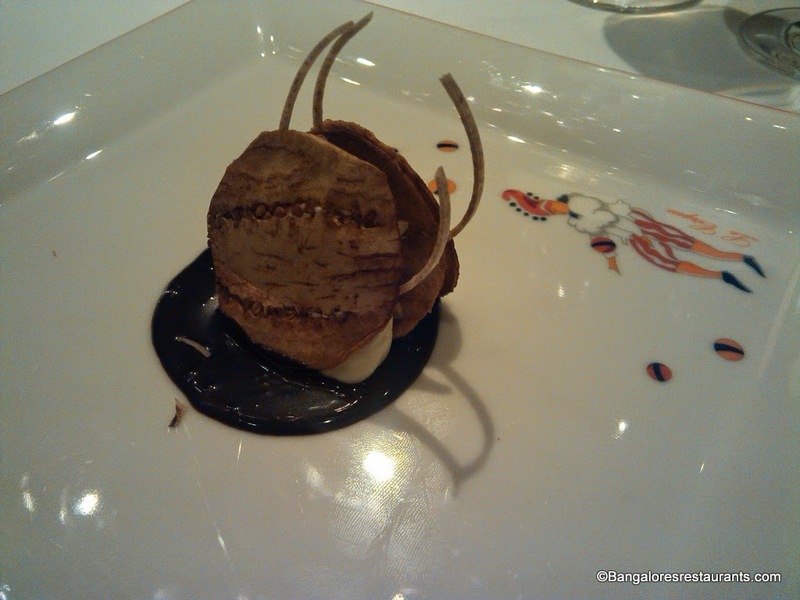 I was invited to a fabulous limited edition sit down meal at the Le Cirque Signature restaurant, which is the only second of its kind in India. The great part about what you are going to read about the food from here onwards is that this menu will be available all through the month of May, at the Le Cirque Signature for a price of Rs 6000+ taxes. And believe me, this is an opportunity to taste some of the signatures created by Chef Matteo Boglione who is at the helm of affairs at Le Cirque... you are not going to want to pass that up! This little porcelain fellow is especially created for the restaurant and encapsulates the circus of flavours that you are about to receive. And much like any circus act, you will want to stand up and applaud at the end of every course. First came a little amuse bouche that worked on touching all flavour points and textures - soft, crunchy, sweet, salt and hint of spice made up this little dish. All through the meal, Mario was a delightful conversationalist and covered a range of subjects from his love for Apple's technology and gadgets, to environment conservation to stories of dealing with international customs and food and so much more. Course 1 - The Lobster Bisque - there is a certain flourish that comes with seeing a tureen full of bisque being poured into your soup plate and enveloping the luscious lobster, the little mound of seasoned tomato and the baked circle of onion. This bisque, was creamy, silken smooth at every sip and had its flavour enhanced by the little touch of tomato, onion and basil oil that were part of the dish. The Vegetarian option was a duet of White and Green Asparagus, with Basil oil and Brie Cheese Fritters. Though this was not something I tasted, the collectively sighs of happiness across the table and the animated discussion on the beauty that is the seasonal white asparagus was testimony enough. Course 2 - My choice was the Gnocco Fritto with Lardo, Finocchiona, Soppressata and Parma Ham. The Gnocco Fritto or the fried dumplings are a classic from the Italian household. Wonderfully non-greasy, with a slightly crunchy exterior, they paired beautifully with the accompanying dip and with the cured meats. Especially the white lardo or cured pork fat with its hint of herbs was divine. 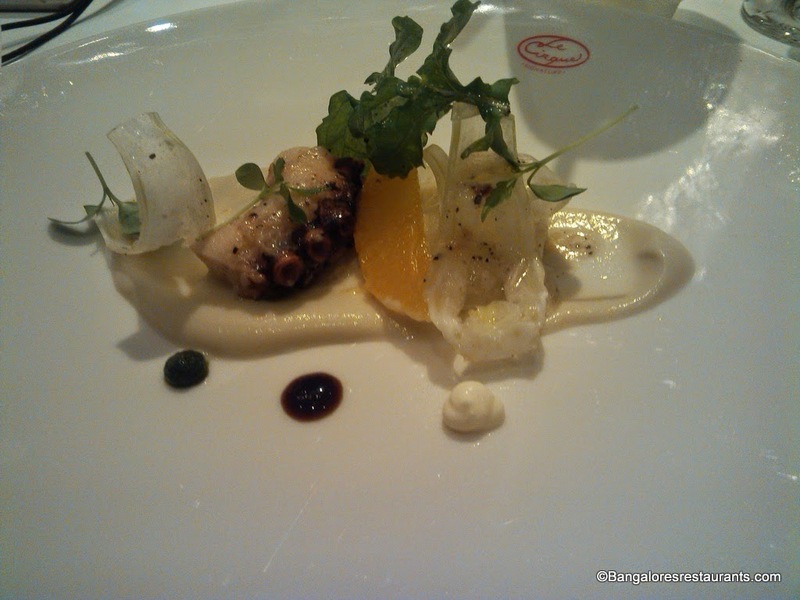 Course 3 - When I saw Octopus as an option in course 3, I did not have to think twice. An Octopus salad with fennel puree, orange segments and basil pesto made for a lovely change in flavour profiles. It is so easy to go down the rubbery path of nothingness when it comes to octopus. But to get it to yield to a butter knife with ease and to have it imbibe myriad flavours is a skill few possess. The other option, though I do not have a photograph, was that of a Pecorino Creme Brulee with Onion Marmalade and Balsamic Reduction. My dining companions insisted I try some and to this hour I am torn between the two options in this course - the cheese and the immensely flavourful onion marmalade brought about feelings of satisfaction that are quite often reserved for desserts! For regular readers of the blog, you know that if I see a risotto, I am going to order it. More so when it is Course 4 and says that I can opt to have Black Truffle Risotto. Let me put it this way - Black-Truffle-Risotto - rice which retains its crunch, black truffle that imparts its magic, flavour that you will go home and discuss for a long while to come. Another option in this course was the Tubetti Pasta, stuffed with Duck Ragu, Lardo di Colonnata, cherries, onion and a flavoursome Soubise sauce. Duck is always a pleasure when done perfectly and this was no exception. A delight on the plate from the one bite that I had from a dinner companion. This picture definitely does not do justice to how pretty this plate was - A Cauliflower Flan with Avocado Morels, Panzella, Buffalo Mozzarella Fondue and Black Truffle Sauce. Once past the prettiness and the urge to simply stare on, the dish did taste as beautiful as it looked. And finally to the last course - Dessert - I saw the Eggplant Millefoglie and there was no saying no - Wafer thin slices of eggplant cured in sugar syrup and dried to a cracker's consistency - vertically layered with cream and nuts and placed over a decadent spoonful of molten chocolate. Not for minute are you going to think - Eggplant! - I am not much of dessert person and often stop after a spoonful or two at best. This plate, I sent back clean. 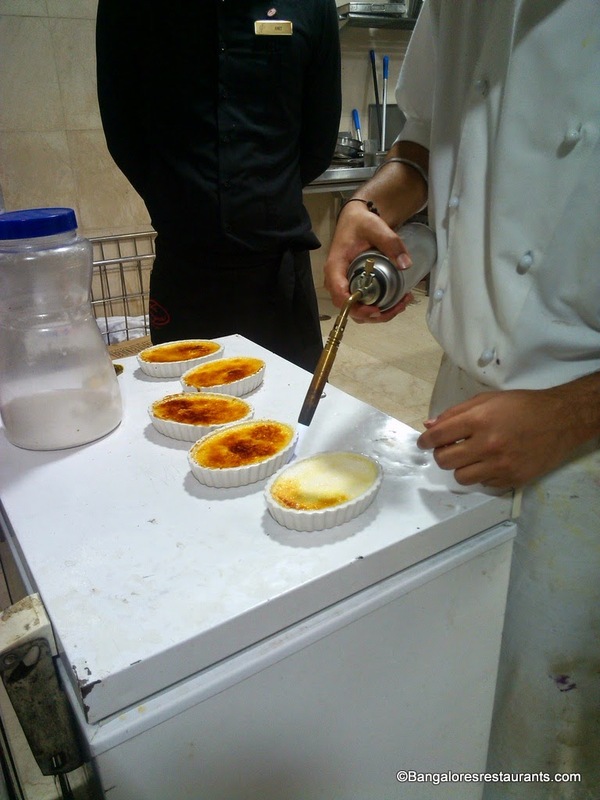 And the Creme Brulee - the crack as the spoon went in sent most of us into raptures of delight. Thanks to Mario, we also had a chance to visit the immaculate kitchen of Le Cirque. To see our desserts, torched, and delicately plated was an absolute delight. The little group that enjoyed this fabulous meal! All through the meal, a bread basket kept making the rounds - The olive focaccia and a lovely onion pastry styled bread were the highlights! 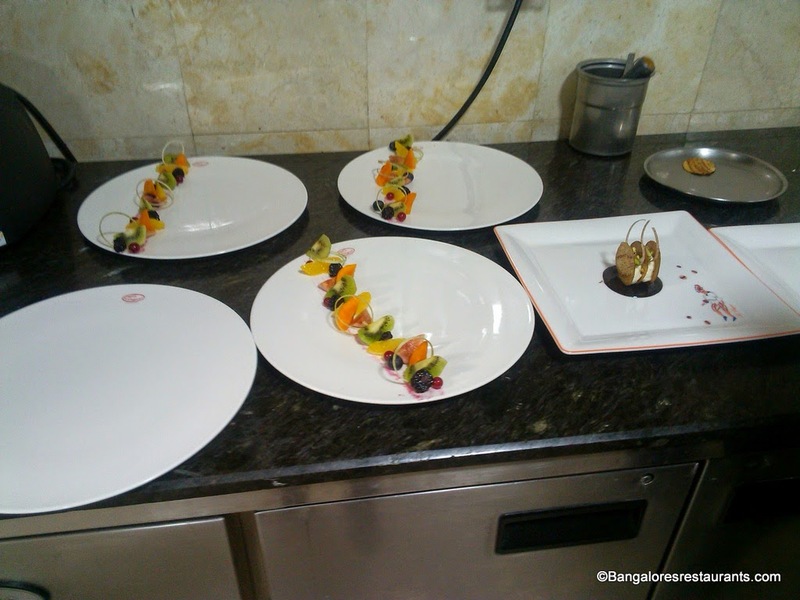 And like I said, this meal is yours to savour and create memories with, all through the month of May for Rs 6000 + taxes. I must make a mention here of the impeccable service. As Mario pointed out, that good service, at a restaurant of this caliber and a meal of this nature is to be efficient without being intrusive and on hand to anticipate needs. This team deserves much more than the round of applause we gave them.